Too often people pass up the mailbox when looking for projects to improve their home or add a bit of pizzazz to their property. As a matter of fact, upon the mentioning of the word mailbox, the first thing that comes to mind for many people is the standard round-topped box that’s mounted on a steel post. And while these mailboxes are functional and sufficient to get the job done, there is an entire world of mailboxes out there that can add class, beauty, personality and improve your curb appeal. The first thing to familiarize yourself when choosing a mailbox for your home is all the different styles and materials that these pieces come in. By far, the most popular are stainless steel mailboxes as they have a plain, sleek look, emanate class and style and are coated to protect against corrosion. Attention to detail matters big time when trying to create an extraordinary design, and stainless steel mailboxes are usually the most advanced style of all existing. The best models feature discreet lock access, a stainless steel visor, a box within a box protective structure, hidden fasteners, a magnetic door latch and whatnot. If you want to go for a more basic look, you can choose a plastic mailbox as this is the most affordable option. It is very easy to maintain, however, it is not suitable for extreme heat, which kind of makes it inappropriate for Australia’s scorching hot weather. These mailboxes have an easily accessible door and are usually post mounted. Mind you, a good residential mailbox can add value to your home, and a plastic one is surely not the best choice for this purpose. 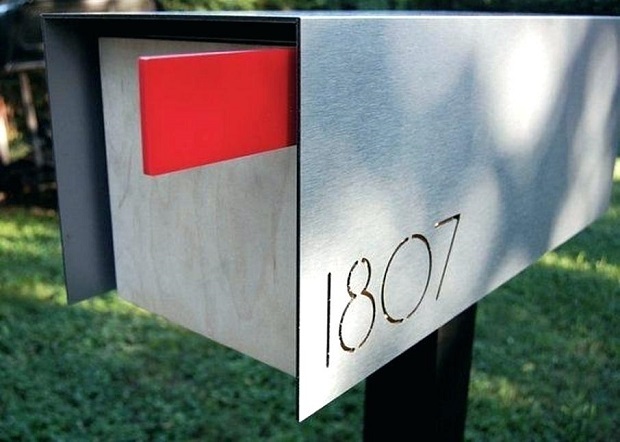 Brass is also a popular material for mailboxes. It has the power to add character to your outdoor setting and add a more formal look. However, it requires a lot of maintenance. It constantly needs to be polished to keep its shine and avoid the green-colored buildup (patina) that is usually caused as a result of the exposure to moisture and air. Bottom line is, the mailboxes of today are not simply for collecting mail – many of them are an extension of the home. Many people plant gardens around their post mounted box in an attempt to make their yard look more inviting and cheerful. Others use fountains, large rocks, statues or fountains to decorate the area around their mailbox. Regardless of which style and material you go for, make sure it complements your existing decor and the overall environment, instead of disturbing it.